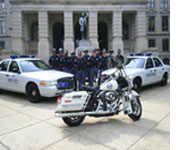 The Capitol Police Division of the Department of Public Safety provides general security to the Capitol Hill Complex; monitors entrances into these buildings by checking all State employees, guests and other personnel for valid identification; screens all incoming packages, deliveries and mail. This unit also provides general security to elected officials, government employees and visitors to the Capitol Hill area. To report emergencies or to request assistance contact the DPS Switchboard at 404-624-7281. Medical emergencies may be reported directly to paramedics at 911 but should also be reported to the DPS Switchboard. Capitol Police can provide assistance by guiding the ambulance and other response vehicles directly to the injured person(s).